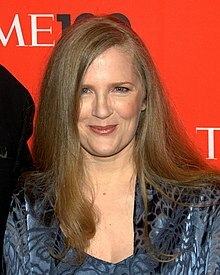 Suzanne Collins (born 1963) is a writer from the U.S. state of Connecticut. She is known for writing in the fantasy and science fiction genre. Collins started her writing career in 1991. She wrote for some television series. Later she wrote a couple of picture books and a five part series called The Underland Chronicles. In 2008, Collins published the first book of the science fiction trilogy, The Hunger Games. Soon after her publications of The Hunger Games, this trilogy became a series of movies. In 2003, Collins published the first book of her five book series called The Underland Chronicles. The books in the series are Gregor the Overlander, Gregor and the Prophecy of Bane, Gregor and the Curse of the Warmbloods, Gregor and the Marks of Secret, and Gregor and the Code of Claw. In 2008 she published the science fiction novel The Hunger Games. This was the first part of a trilogy. The other two books are Catching Fire (2009) and Mockingjay (2010). The first book was a New York Times best seller. It was named in Publishers Weekly's "Best Books of the Year" in 2008. Lions Gate Entertainment made a movie of the book. The movie received positive reviews from Stephen King and Stephenie Meyer. The first movie was released in 2012. It became very popular. Lions Gate Entertainment decided to make movies of the two other books. Catching Fire (the movie) was released in 2014. The first part of the movie Mockingjay came out in late 2014. In 2013, Collins published the book Year of the Jungle. ↑ "Suzanne Collins". OpenISBN Project. Retrieved February 8, 2013. ↑ Warner, Brian. "Suzanne Collins Net Worth". Celebrity Net Worth. Retrieved August 5, 2013. ↑ "Press And Reviews". Thehungergames.co.uk. 2009-02-20. Retrieved 2010-08-13. Cech, John. “Collins, Suzanne”. World Book Student. World Book, 2015. Web. 23 Mar. 2015. "Suzanne Collins." Newsmakers. Vol. 2. Detroit: Gale, 2011. Biography in Context. Web. 23 Mar. 2015. This page was last changed on 31 October 2016, at 16:27.